After my babies were tucked in bed last night, my husband let me sneak away to go meet and snuggle my friend's baby girl who was just a few hours old. I had been quite confused as to where I should park, but once I made my way into the cooridors of the hospital, a flood of memories came rushing back. It has been just 10 short months ago that I was at the same location to meet my baby girl. As I pushed the button and waited for the elevator to take me to level 2, my heart began to pitter-patter at the rememberance of that night/early morning. I arrived at the maternity ward and on into my friend's room to marvel at her newest, sweet and perfect, gift from God. Babies truely are miracles. My memories continued as I said my congratulations and goodbyes and walked the familiar hallways back to my car. I was overwhelmed with joy at the thought of one of my proudest moments...the moment the nurse put me in a wheelchair and the new miracle in my arms and she pushed me down the hallway to my recovery room. I remember the pride and joy I had when the hospital staff and passerbys would stop to get a glimpse of her tiny beauty. The pride and joy I had over her was not from anything she had done or was going to do...it was just simply because she was mine. On my short drive home last night, I had a million thoughts [recaping the day] going on in my head....but, by the time I got to my drive way, the Lord left me with one lasting thought... That parade down the hospital hallway with my baby in my arms, must be just a glimpse of what God feels for us when we give our lives over to Him and we become His beloved child....not because of anything we've done or are going to do...but simply because we are His. Joelle started sitting up on her own a few days shy of turning 6 months. That day, I was getting her dressed and came across the blue and white outfit her sister was in the day I documented the same milestone. 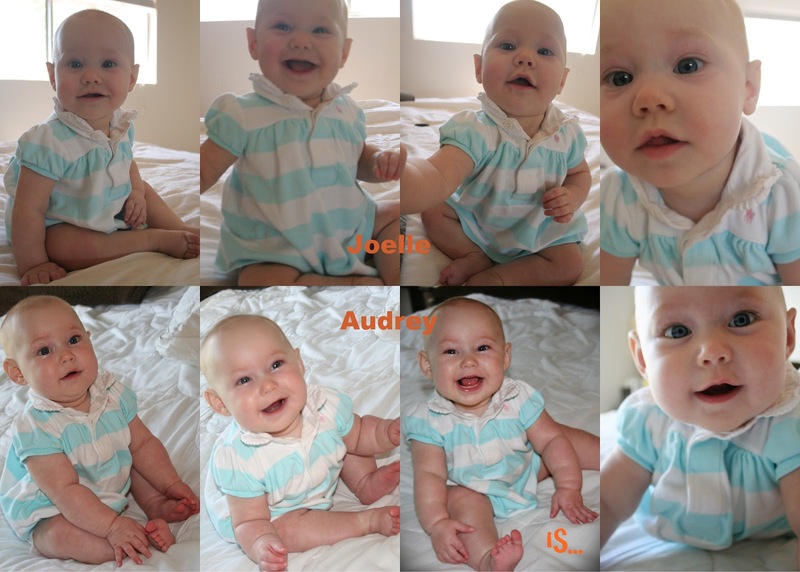 I thought it would be fun to take some pictures of Baby Sister to see how much they look alike. The resemblence is uncanny....so much so, that when I sent the pictures to Ryan, he couldn't even tell them apart! -A perfect addition to our family!! Hi! Thanks for stoppin' by. My name is Jessica...saved by God's Grace; in love with Ryan; proud mama to Audrey Joy and Joelle Grace.